INSUL-DECK is a very fast, versatile construction system for Floors, Roofs and Elevated Buildings. 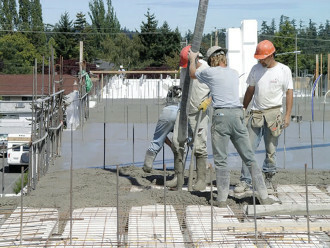 The stay-in-place insulating concrete forms (ICFs) are made of Expanded Polystyrene (EPS), an insulation material of choice for many decades using no CFC or HCFC gases. Integrated steel beams are molded into each Insul-Deck panel creating formwork for the support of concrete, reinforcement, and construction loads with minimal shoring. The forms are lightweight so that two people can handle each panel. Insul-Deck also reduces the floors’ weight, producing a T-beam shape instead of a conventional flat slab. Ceiling finishes, such as drywall, can be attached directly to the INSUL-DECK forms. 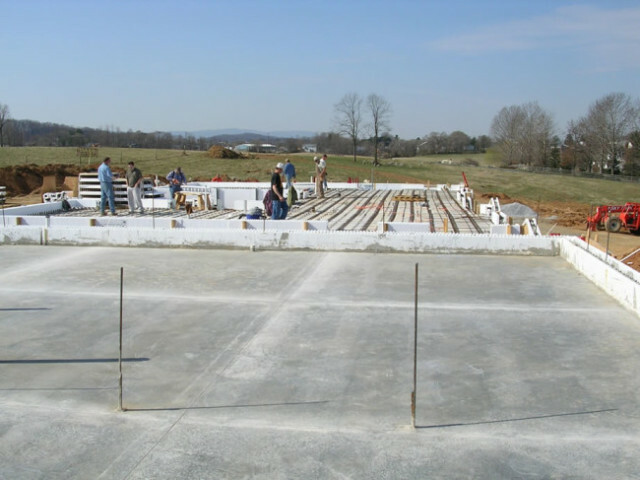 To speed up job-site installation, Insul-Deck concrete forms are made-to-order in whatever lengths & thicknesses required using a patented continuous molding process. The system is the result of years of research, design, and practical field experience. Each INSUL-DECK panel is supported and reinforced with two integral steel beams molded into the product from end to end. The result is a self-supporting joist and deck forming system that provides the maximum strength of a reinforced concrete deck with a minimum of materials and installation labor. Molded-In Steel Beams (extended for illustration purposes) are continuous providing the strength for Self-Supporting Concrete Forms, which greatly reduces shoring and labor. They also serve as Attachment Points for Finishes every 12″. For example, drywall can be screwed directly to the exposed steel furring strips at the bottom of each panel. Utility Chases can be used to install a variety of electrical, plumbing, or ducting. It’s easy to enlarge those chases by simply cutting away some of the insulation (after the concrete is poured and cured). Tongue-and-Groove Interlocks form the bottom of the concrete T-beams, or joists. Rebar reinforces each joist with Double-Rebar-Chairs available from Insul-Deck. Steel mesh or rebar reinforces the floor slab. Engineering guidelines and detailed design documentation is available for a wide variety of project requirements. INSUL-DECK is available in 7 different thicknesses (7″, 8″, 9″, 10″, 11″, 12″ and 12.5″), creating concrete joist depths of 5″ to 10.5″. The R-values range from R-14 to R-28. The 2′ wide Insul-Deck panels are custom-made at the factory to the lengths required for your construction project, eliminating waste in labor and materials. 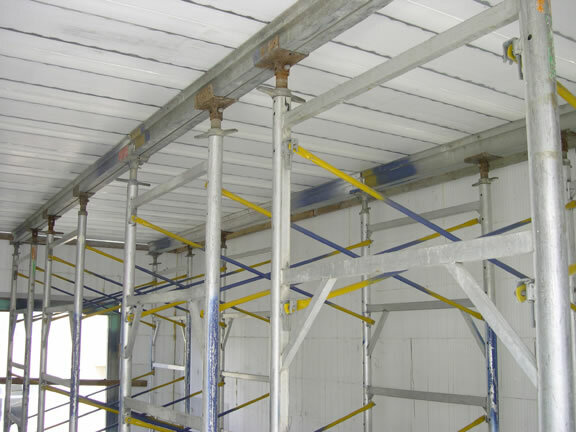 You can achieve up to 33 foot clear spans with residential live-loads and regular construction methods. For longer spans or higher loads, special techniques or secondary structural support may be required, see Technical Summary. INSUL-DECK needs to be supported underneath with typical shoring, usually about 6 feet apart. The structural engineer or shoring engineer (often provided for free with shoring rentals) is responsible for the correct layout and specifications. INSUL-DECK acts as its own formwork so no falsework/ plywood is required which makes INSUL-DECK quick to install – saving on installation and stripping labour. Top Hats increase INSUL-DECK’s effective beam depth which in turn increases live load capacity and free span of the floor system. Top Hats are made from modified Expanded Polystyrene – EPS that includes flame retardant. They can be custom ordered in any thickness for project-specific requirements. Copyright 2019 © Insul-Deck. All rights reserved.